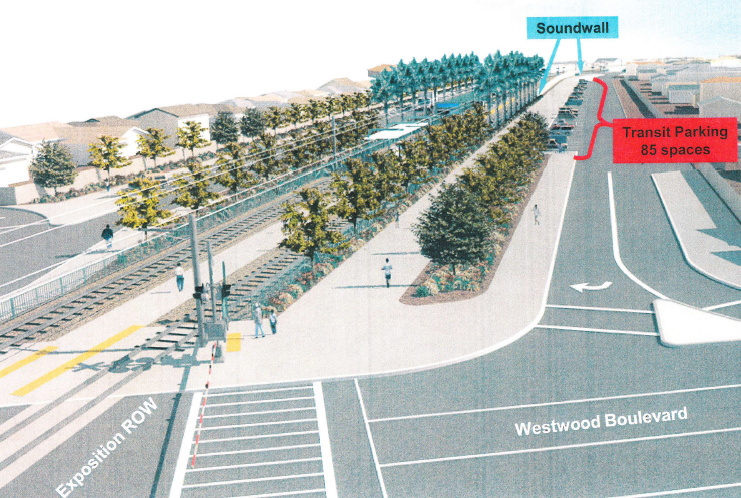 Rendering of Westwood Station without car parking. Image via ##http://physics.usc.edu/Undergraduate/temporary/westwood_w_parking_wo_parking.pdf##presentation by Expo Authority## posted online by Gökhan Esirgen. Now that the Expo Construction Authority has the legal green light to begin construction of Phase II of the Expo Line, it can move on to other issues. Responding to a motion at the February 5, 2010 meeting of the Expo Construction Authority by Zev Yaroslavsky, Expo staff have put together a presentation listing the pros and cons of having station parking at the Expo Station at Westwood and Exposition. The “no-parking” option has been endorsed by many of the groups backing the Expo Line such as Light Rail for Cheviot and Friends 4 Expo Transit. The Construction Authority Board is expected to vote on whether to provide commuter parking at their March 18 meeting. By removing commuter parking from the design, the Westwood/Exposition Station is surrounded by open space. At the north side of the station, an additional 54,000 square feet would be created. As staff notes, that is roughly the same size as a football field. The south side would have “only” 23,750 square feet and a “kiss and ride” drop off area. While the above rendering shows a gigantic brown squares, this space could be filled with amenities such as coffee shops, food trucks or other features one associates with first class transit station. There would be some parking with the station. 20 spaces would be reserved for people visiting or living in the community, to replace some of the street parking lost by the station. Very short-term parking will be allowed in the Kiss-and-Ride area for people waiting to pick up an Expo passenger. By comparison, the option with parking wouldn’t have space for any of those things. But, it will have lots of low cost car parking. That's a lot of asphalt. The plan with parking calls for 170 parking spaces, with access to the stations from Westwood, Overland and Selby Avenues. As you can see, there is room for landscaping in the project, but not really room for much else. So here’s the decision that has to be made, does the Construction Authority value 170 parking spaces over station amenities, open space, maintaining a permeable surface around the station, limiting the environmental damage caused by increasing car trips to the area and encouraging people to walk and bike to the station. When the Expo Board posts their agenda, Streetsblog will post it. In the meantime, if you have an opinion on which station design you like best, you can email the Board of Directors for the Construction Authority through this website. I’m actually already very familiar Donald Shoup’s work. I think he lives in westwood and teaches at UCLA, right? I know of many of his arguments and I agree with him in general, but I differ on some of his points. I think where we’re headed is a future where the haves can drive, and the have nots won’t be able to as much. I’m not sure if you’ve done the math recently, but it’s looking like owning a gas powered car that gets say under 20 miles per gallon is not a financially good choice compared to a hybrid or electric car. Essentially we’re going into a period of time of, as gas prices becomes more expensive, as we’ve seen etc..etc.. the viability of everyone driving is not going to happen. What will happen is this will hit the poor the hardest as every economic issue does. I guess what I’m getting at is we need this parking lot to adjust to our future transit needs. Without it we won’t be able to adapt, with it we can have at least some choice for people to get to and from. I think I’ll have to decline your offer, but thanks it’s a good one. I’m probably already on the same page as you are on most of this stuff. I just think as far as this parking lot goes and considering there is not free parking in general in the area, this makes a lot of sense to attract people towards using the train. That is the highest priority. I would chose getting this city more transit oriented, and having this lot to assist in doing that. If you really want to make a difference on these things you could consider adopting some things in your life that aren’t the norm yet, but probably will become the norm. 1. Don’t ever drink bottles water. Huge waste of energy, and bad for the environment. 2. Wash all your clothes in cold water it’s less of an energy user. 3. Walk, bike, take public transit more. 4. Eat less meat it’s more energy intensive kind of food. 5. Create less waste like always bring bags to the grocery store that kind of thing. 6. Sign up for the DWPs renewable energy program. 7. Buy an electric or hybrid car. 8. Take the train long distance instead of flying as I have started to do more often recently. contact me if your interested in any more of this. The need for parking for Expo is being addressed in plentiful fashion at the Venice/Robertson station, and also at Sepulveda station barely 1/2 mile from Westwood station. Your principled arguments about need for parking are fine but it doesn’t reflect the reality of the demand for people using this station. Westwood station does not need parking. Period. As I have already pointed out, Westwood Blvd is the busiest bus corridor on the West side NOW. This station is on the path or very near the path of 8 different bus lines (BBB4, BBB7, BBB8, BBB12, BBB13, Rapid 7, Super 12, Century City 3). The vast majority of people arriving at Westwood station will be by bus. Some will be on foot. The net effect of providing 170 parking spaces at this location will be to induce unnecessary driving from people who would otherwise take the bus to this location. They will circle the neighborhood side streets looking for parking as the parking lot you want to construct will inevitably be full, all the time. But these are also people that can either easily drive to Venice/Robertson, or take one of the many buses to Westwood station. To put it bluntly, this station is designed to serve UCLA students and employees working at companies located in Century City and Westwood – it allows them to easily transfer on bus to their final destinations. It’s not a park-n-ride station and it will never be even if you put in 3,000 parking spaces. If people living near Cheviot Hill wants to drive to the Expo line, they can still do that – at two different location that both offer significantly more parking stalls than Westwood will be able to accommodate. I think you’re not seeing the forest for the trees with this one. What’s the right number, in your view, of spaces to build around this station? If we follow your logic that a parking space = a rider and that we should completely disregard the cost to the taxpayer or the induced driving that the parking space causes, then the answer is that we should surround the station with an infinite sea of parking. If, on the other hand, we follow Shoupian logic and only build parking that makes economic sense – i.e. parking that when priced to accomodate demand will generate enough revenue to pay for its own land and asphalt – if we do that, then we get a very small number of spaces. Parking would need to be scarce and turn over several times a day, something that would in fact encourage people to carpool if they did drive to access the station. I want to be clear that what you are suggesting is that those of us who make the right choices – bike, walk, and take the bus to this station – subsidize people who make the wrong choice and drive to the station even when they could choose otherwise. I want to be clear that you are suggesting we hide from these drivers the true cost of their activity. What do you think is a good principle by which we should decide how many spaces to build? I submit that the question is actually an empirical one, and that if we optimize our investment to bring the most ridership, we will find that parking is one of the least efficient investments. The money spent to pave and operate those spaces would be much better spent making trains or buses run more frequently, or decreasing fares, or etc. At the end of your comment you list some things I can do to “make a difference,” and one of them is “Walk, bike, and take transit more.” Your policy, free parking at the stations, makes me a chump for doing those things. See, when I bike to the station instead of drive, I happen to be saving everybody a little bit of pollution and a little bit of CO2 emissions. But under your policy, I’ll pay the same amount to access the station as someone who gets in a Hummer by themself and drives to the train. I believe in fair public policy, and it’s not fair to use my taxes to fund my Hummer-driving equivalent’s parking spot. They know that convention center/ Little Tokyo parking is a pain in the neck, whereas Long Beach parking is relatively easy. Now, Westwood isn’t Willow and the circumstances may be different, but let’s not demonize train station parking in general. Sometimes, a park-n-ride station in the hand is worth two bicyclists in the bush…. Sorry bzkat I think you’re totally wrong on this point. As I’ve pointed out many many times here. The westwood station is going to be the busiest, not the venice/robertson station, or the sepulveda station. People are going to go to and from this station more than any other. Therefore the obvious conclusion is you need some way to accommodate those folks and a parking lot helps to do that. Sorry bzkat you gots your facts all mixed up. thanks James I agree with that. You’ve backed up my point that parking lots attract people to use the train. People know how much it costs to park where they are going. Haveing free parking and a lot encourages, and doesn’t discourage ridership. thanks for all the good points Herbie. As for myself I would love to live in a world where I can bike walk, and ride the train everywhere. That’s what I encourage to all those around me try to put forth to the world. Were at the same place on this. But as James pointed out and as I have experienced many times a parking lot attracts those folks who don’t normally ride the train or bus. In L.A. most of the people middle class and above done’t ride public transit which is a shame. I think a parking lot is key to attracting those people to use it. I think we’re coming from the same place, but I think we need to do more to attract people to use the train that’s all. A parking lot does that. Any more comments? Keep them coming. Parking will not attract ridership to the point where it offsets the cost of said parking. If you only have 170 spaces that is 170 additional people to take the train. People will take advantage of free parking to avoid paying for parking in DTLA. I bet most of the free lots on the goldline are filled up by 7:00 am by people that want to pay 3.00 a day and free parking than pay $15 a day for parking in DTLA. sure there is the opportunity cost in taking the train, but free parking definatly transfers parking costs from individuals to tax payers. If you have logic chain confused. Westwood station is going to be the busiest station BECAUSE it has direct bus connection to Century City and Westwood, not because it has lots of low density single family homes around here. Let me repeat. WESTWOOD STATION IS GOING TO BE REALLY BUSY BECAUSE ALL THESE PEOPLE COMING HERE BY BUS. The projected ridership data is all based on the assumption that people will be using this station to get to work/school at Century City and Westwood. Huge parking lot is not going to be needed at Westwood station because people won’t be driving to this station. You continue to avoid acknowledging the existing commute pattern at this station location makes me wonder if you are familiar with the surrounding area at all. Westwood station is not going to be a major origination station. It is a major destination station. You want park-n-ride at origination point, and very little parking at destination point. Okay so I think after reading over what were debating here it looks like to me we’ve gotten to this point. I think we should have a parking lot to accommodate those that won’t be taking a bus, or or otherwise. Herbie, and bzcat seem to want open space and don’t think anyone would use a parking lot or should use a parking lot there. Here are the official numbers from expo on their predictions. 5,237 are predicted to use this station every day. 4,895 is the number that is expected to take public transit from to there or bike, or walk every day. 342 is the number expected to drive there and want to park every day. I guess I still think that we should have a parking lot to accommodate those 342 people every day. The reason the lot is supposed to be 170 spaces is that should accommodate that number of people throughout the day as people come and go. For one day it’s doesn’t look like that much but for a year that is 124,830 trips that otherwise would have been prevented by people not having a parking lot there. I think it’s worth it to increase ridership and to get more people to take that train than otherwise wouldn’t. The cost of this parking lot is small in comparisson to the spending on the rest of the project, and there aren’t many real world benefits to such a small amount of green space being there instead. If you really think about since we’re throwing lots of different environmental reasons to have or not have the lot you should want the lot to be more environmental. If you look at those numbers this lot will attract these 342 riders every day that would otherwise not take the train. Like I said over an entire year those cars will create lots of pollution etc..etc.. This lot gets more cars off the roads and that’s what we need. Here are some more numbers for you. For 342 trips per day for a year at an average of 12 miles one way per trip that would account for 912 tons of carbon produced, or 2,394 barrels of oil a year. I came up with this calculation with the http://www.terrapass.com carbon footprint calculator. Over a ten year period of time this would be 23940 barrels of oil saved. This parking lot would make a difference positively for the environment. In addition that many cars over the entire day probably wouldn’t have that much of a negative impact on traffic in the area. The westside pavillion has thousands of parking spots in it maybe as many as 4000, and yes there is traffic near there but imagine the kind of impact were talking about here with 170 spots. The positives out way the negatives in this situation. We should have a parking lot at this station. In addition as I have said many times here this lot should include(by taking out a handful of parking spots) many motorcycle, scooter and bike parking spots that would increase the number of vehicles going there and increase the ridership there. We should have a parking lot at this station. Under state law (section 5642 of the The Statewide Park Development and Community Revitalization Act of 2008) the community surrounding the Westwood Station is a “critically underserved”** regarding open space. *Community Fact Finder is a web based tool that combines mapping and demographic data to calculate the total population, median household income, number of people below poverty, and ratio of park acres per 1,000 residents within a half-mile radius of any project location in California. Why is the half-mile radius used? The priority is to fund projects in “critically underserved” communities. (1) Has less than three acres of usable parkland per 1,000 residents. (2) Is a disadvantaged community, as defined by subdivision (g) of Section 75005, and can demonstrate to the department that the community has insufficient or no park space and recreation facilities. We are looking at, by Expo’s numbers, 77,750 square feet of open space, or 1.78 acres. thanks for posting this information although I’m a little bit confused, because one of the main criteria is that the area is poor or disadvantaged. I know you said either of these two. I think there isn’t much park land right there next to the station, but there is a very large park, probably the largest park in west L.A. walking distance maybe a half mile or less away from there. It’s called the cheviot hills park, and the westwood station is in cheviot hills. This community isn’t under served when it comes to park land. This park under these circumstance isn’t really a net positive. I think most people who are against this lot don’t want the lot in their neighborhood and aren’t thinking objectively about this. The 342 car trips does not imply there will be demand for 170 spaces. Some people will be dropped off and some people will carpool. The 342 car trips number actually supports the notion that 170 spaces is overkill. I’m not advocating for open spaces per se. I’m advocating sensible parking in relation to demand. And in this case, the data clearly suggests that only minimal amount of parking for local residents is required at this station. As to the parkland argument, I don’t really have an opinion. But your assertion that Westwood station is in Cheviot Hills is incorrect. It is in fact in Rancho Park. Cheviot Hills in the neighborhood to the east and they do not have a station. My experiences with the Orange Line and Red Line stops in the valley strongly suggest to me that some of the parking is going towards people that are using it to park there and then go to the local businesses or parks etc. That is something frequently overlooked. Convenient parking spaces for cars does encourage people to make short trips with their automobile rather than walk or ride a bike. People will just naturally pick the fastest and easiest way to get there. I don’t doubt this, but how did you test it? If you think I mean the Westwood station is exactly at cheviot hills your probably being to specific and missing the arguments here. My point is whatever you call this neighborhood or that neighborhood doesn’t really matter. It’s really all just one neighborhood from Sepulveda to the cheviot hills park. The point here you seem to keep missing with unnecessary nitpicking like that is that this neighborhood is not undeserved by green space. They all have access to a huge amount of park space which is appx. 1 mile away from the station. There is no need for more open space there, a parking lot serves a greater need. This is incorrect. People will decide whether or not to ride the train based on the whole package that is offered to them and whether or not it competes with their other choices. Yes, there will be a very small proportion of riders for whom free parking at the station makes the difference between driving and taking transit. But some of the 342 park-n-riders would have taken the train anyway. Free parking will make the difference between bussing and driving for some of these people, and between bussing and biking for others of these people. In your subsequent analysis you count all of the 342 park-n-riders as car trips diverted and greenhouse gas emissions avoided, when in fact in some cases, they actually represented new car trips that would not have happened without the parking. You should be adding emissions, pollution, and congestion back for all those new trips and finding the balance. But again, the situation is more complicated. As some folks here have already mentioned, people will drive Out of Their Way to get to a free parking lot and ride the train, in order to avoid parking fees at their destination. In some cases it will be perfectly rational for them to actually drive Farther to get the free parking. So your average of 12 miles of driving that are avoided is complete bunk. You should really calculate how long folks would have driven without the free station parking and subtract from that how far they drove to get to the station. If you were to do a similar analysis with air pollution you would have to cope with the unfortunate fact that most of the pollution that a car trip produces happens immediately after the engine is turned on, in what is called a “cold start.” The cold start will happen whether the person is driving all the way or driving to the park-n-ride lot. So the impact on pollution for a person who switches from driving to park-n-riding is negligible. The major conceptual error that underlies both of your incorrect assumptions is that you assume that there is just a fixed demand for both driving and parking that is just “out there,” and we should build to accommodate it. In fact, people decide how to get from A to B by picking the mode that minimizes the costs to them. In this way, free parking Causes more car trips. This is a fundamental fact. If you want more people to drive, subsidizing driving will reduce costs and get more folks behind the wheel. Free parking is subsidizing driving. Free parking at Westwood Station will draw car trips that otherwise would not have happened. Folks that would have biked or walked will drive. Some folks that would have driven to work will park-n-ride. On the weekend, folks that would have biked and walked to the store or other adjacent destinations will drive to the parking lot. I think most people here have said that if people want to drive to the train, that’s fine and let’s go ahead and make that possible, but let’s have them pay the fair cost of their parking. Let’s not hide that cost from them. Why should LA’s taxpayers be in the business of hiding costs from drivers? That runs counter to the spirit of Measure R, which is to reduce congestion by discouraging driving. I guess I would conclude by returning to the concept of subsidy per rider. The subsidy per rider for those 342 park-n-riders is very high, since they are using parking that costs a lot to build and maintain, and that has a high value on the market. Recall, per Juan’s calculations, that each space has to earn about $15 a day to pay for itself. Now, what free parking does is it gives a huge portion of the total transit subsidy to a small number (<5%) of the riders. Given that we have a limited amount of money, I'll say again that I think we should spend it in the most effective ways. Why spend lots of subsidy on a small number of riders? I'd rather spend it on running the trains more frequently or writing next-train apps or running the connecting buses more frequently. All those spread the subsidy out more fairly among the riders. (1) Construct open space, which measurably improves mental health, has economic benefits, and absorbs carbon and pollution. Use the reduced operating costs at the station (relative to the cost of maintaining and managing parking) to run more trains, clean them more frequently, run more buses, etc etc. (2) Construct a parking lot, which is ugly (to be blunt). Subsidize driving at a high cost per rider for only about 3% of the ridership, all people who own cars and have other choices anyway. Divert some access trips to the station away from biking, walking, and buses to driving. Induce some other car trips on the weekends. On balance, have an uncertain effect on total miles driven. Thanks again Herbie for your comments and your real interest in all this as is apparent in your in depth response. As I was saying with bzkat I think your getting trapped in the morase of the details. I mean it’s true I have given approximations here to argument that a parking lot serves more purposes than a small amount of green space. I think though in the same way that I am making some rough assumptions and approximations here I think your doing the same thing. You’ve made an assumption here the somehow this small amount of open space (1.5 acres) will “measurably improve mental health”. There is no way for you to quantify this and I think if I am making some broad assumptions here your assumptions may be even larger given this example. I think it’s a safe bet to say having some parking, at a station that will have very high ridership will increase ridership to that station. I don’t have the time or money to prove this in a well researched study, but I think it’s a safe assumption. I mean you give a longer, and good effort to your argument, but I’m sorry, I think you’re wrong. No one here has been able to show that this 1.5 acres of green space will provide a net positive over the net positive of a parking lot. If this land happened to be adjacent to say the cheviot hills park and added on to that park so that it could actually be used more as a park I would be fine with that. This small amount of green space though would be equivalent to the kind of tiny green space you see in front of some office buildings that never get used. Another assumption you make is that this green space will be grass which will soak up carbon or will have trees. We don’t know for sure that there really will be trees or grass here anyways to soak up that carbon. It could very well be this just ends up being dirt, or rocks. Also if you want a landscaped area you have to have landscapers that you have to pay to maintain it. There is a cost there that is probably roughly equivalent to keeping a parking lot functioning. I would like that lot to be free, but even a minimal 1,2,3 dollars should cover the costs of upkeep on this lot. Better luck next time Herbie sorry. We should have a parking lot at this station. Our fundamental disagreement is about whether or not the parking lot is a net positive. I believe it is a negative, since it subsidizes car trips that would not have otherwise been taken without the subsidy. You believe it is a positive, since it will add ridership. I think the ridership added is insignificant and not worth the pollution, congestion, and equity problems associated with subsidizing parking. My interest is not in ridership for ridership’s sake. I want to provide mobility to those who have little and to create real systemwide alternatives to driving. A parking lot does not achieve these goals because it targets people who already have other options, so I am even less interested in it. At this point I think there’s nothing you could say to convince me to cough up some tax dollars for drivers. And there’s nothing I could say to convince you that the parking lot ain’t worthwhile. We are at an impasse, which I find kind of tragic, because we share some goals about promoting transit. At least we can agree to disagree. Thanks for the vigorous debate. Eric, I think you are the one “trapped in the morase of the details”. The facts are pretty simple, Westwood station will attract mainly users that will arrive by bus or on foot. There is no need for 170 space parking lot. Period. Your mindset from the beginning has been, this station is busy so it must need parking to allow people to park & ride. We have repeated shown you that this is not the case. This is not a park & ride station, and people will not arrive here by car in the kind of numbers that justify turning a residential street into a giant parking lot access lane. If you are really open minded about this issue, you should at least concede this point… 170 spaces (as planned) is overkill. Sorry bzkat, this is obviously not the case based on expo’s own projections of how many people would get there by car and thus the 170 spot parking lot recommendation. I realize you’re a proponent of no parking at stations. Although I wonder if everyone that doesn’t want these parking spots, do you support the parking at any other stations? I know some are park and ride etc…etc.. but some here have said no parking no matter what. So does that stand everywhere??? In fact, the land will be connected to Palms Park by a bike and walking paths. Because of the 100 (wide) feet of City land abutting the ROW, this will be a double wide part of the ROW. Regarding the green use and funding, please see http://expogreenway.org/Conservation.htm Funding is available, and sought by the City, under Prop. 84. Haters gonna hate, parkerzz gonna park! All day free parkerzz, park on! Thanks Johnathan I appreciate the thought here, but I think you know it’s not what I meant. If the park land added directly to the park it would be useful. No one here has really determined how this park could really be used positively. Can anyone really give some strong examples of this park can be used? Benefits of parking lot? Smell of gas? encourage people to drive to station? place to park as close as possible to station? eyesore? I’ll take the park, please! rejects the notion that car parking is an unconditional right..
making for a healthier environment. It only does this if it’s a natural green space. Trees would be good, rocks/sand would do nothing, grass also could be seen as negative given the water and energy needs. pleasant on the eyes for locals. I think if you break this down as I have here there isn’t that many real tangible benefits to this park. I would agree that there could be some intangibles like a place to play, but that’s only if it’s done right, and just over an acre of land is a very limited area. I think there are some things we would have to get ironed out to see any positives for a park like would this be a landscaped area with grass? Would there be a bench, or benches or something else for people to play on? I still think we should have a parking lot it serves the greater good here. Increasing the usage of this station is the highest priority. We need more people getting out of their cars and using trains in the city. Can anyone think of any other real world tangible benefits to having this park? Have you heard of a pocket park, eric? They do plenty good with less space than we are discussing here and they take just about any form. And regardless of what kind of park it is, a park is an infinitely greater meeting spot than a parking lot. And people watching and newspaper reading may not be necessary but you only asked for benefits, not ” what can only be done in a park”. Those are just enjoyable ‘side effects’ of the park. I already told you it can be a place to play kubb, and other similar games that don’t require a lot of space, but likely more than one typically finds in their yard. Pleasant on the eyes is almost absolutely true for any park is certainly more true than for a parking lot. And you say a grass lawn is bad. But isn’t it bad if more people drive to the station due to a parking lot? Parks serve multiple purposes, eric, and you can’t decide for the public how they choose to use that park space– you can’t say “only if there are benches”. People sit wherever they please, and I see many people sit on grass. Number of people I see sitting in parking lots? Zero. A place to sit, even if it’s a patch of grass or a bench or a tree to lean on, parks provide greater opportunities to a greater variety of people than your parking lot which will primarily be used during commuting hours, by people who drive. Conversely, a park can be used by anyone, the popular 8-80 age group which is wider than your age group. A park can be used by poor, and rich, not just those rich enough to drive. A park can be used to its full potential more frequently than a parking lot which just covers the working day, and working days. I agree with lots of this and would be interested if you could provide some examples of a pocket park.?.? It’s funny though I could say the same thing about age range and all that about access to the station. Having a parking lot could give handicapped people access to the train that wouldn’t otherwise etc..etc…. It’s true I won’t be the deciding person and neither will you. So far it looks like the MTA board will decide. A pocket park is basically small space converted to a neighborhood park. I have only seen ones that appear on corners in residential neighborhoods. I will gladly photograph one that is a block away from my house if you’d like. I think you’ll be surprised by how popular, safe, and visually nice they can be. Look at the first four photos in this link. They demonstrate how pleasant park space is, even if it is rather minimal. Can provide basketball, gather place (even a disabled person!) It is not a pocket park, but uses no more space than any regular pocket park does. I take it by your ‘later’ comment you won’t be returning, but I don’t mind helping you see the benefits of park space, no matter how small. I think this logic is zany… we need parking lots (at great public expense) so that people will adapt to high gas prices?? If you’re worried about high gas prices, why on earth invest in parking lots?? Invest in other modes, so “the poor” have options other than driving! Well, actually, “the poor” don’t drive… they take transit, ride bikes, and walk… so they actually do just fine without any parking. If we use limited transit funding to build parking (especially parking that’s “free” to the user), then we’re taking away transit dollars that could toward overall mobility and putting them toward subsidizing car usage… and if we’re having to subsidize the poor to support their owning cars, then we’re going to waste an awful lot of money… and we’re also going to create a bunch of ped-unfriendly parking lots that discourage walking and biking… better to put in a restaurant, a park, bike rental, etc… things that activate the space, instead of a parking lot that deadens the space. It’s one of my pet peeves that Metro chooses to raise fares and cut transit service, while providing free parking… I think that’s a poor policy choice that, in eric’s words, hits the poor hardest. My choice would be to emulate the Seattle’s very recent rail model: no government-built parking anywhere in the system. http://la.streetsblog.org/2010/03/03/streetfilms-seattle%e2%80%99s-link-light-rail-%e2%80%94-the-start-of-something-big/ Way better to invest limited dollars in rail than in parking. Where there’s a real need for parking, then there’s a real market for parking, then let private entrepeneurs build parking around stations and charge market rate for it. Another absurd alternative is to offer lots of free parking – just to make sure there’s plenty to support the Christmas rush and the occasional Laker parade, maybe tear down half the neighborhood, so that there’s always enough free parking! Why because disabled people can’t take a bus? Your searching for bullet points to prove you are right. You really should have conceded long ago. are posted? Looks like this blog has become a useless waste of time. Nobody here changed my mind and instead it’s bolstered my beliefs. I can’t wait to go advocate more for this parking lot. Nice one obvtroll. Well because most of the comments sans obvtroll are actually well thought out and have data and logic behind them. If you get flustered over a comment that quite frankly is kind of true then you really should not let your feelings get hurt by posting here. You are being a troll but at least you are a polite one. Looks like our troll eric will need to find a new hobby. Logic and fact based decision = no parking. 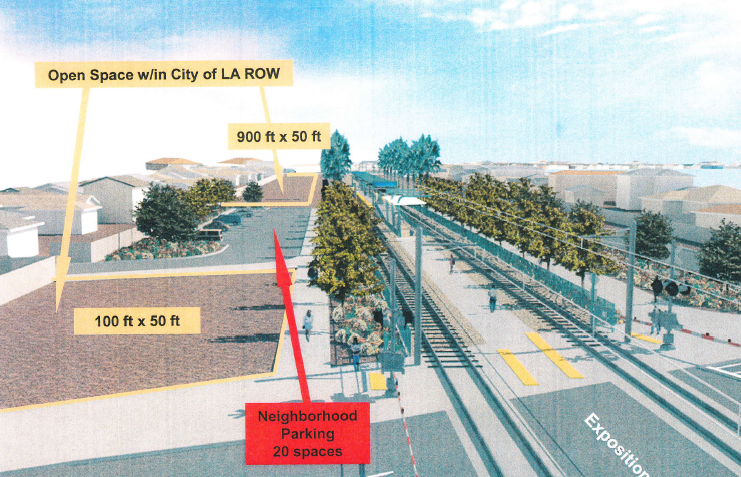 The Exposition Line Construction Authority Board of Directors will award the $547 million design – build contract, which includes the Sepulveda aerial station ($5.3 million more than at-grade station) and Westwood Station no-parking ($0.1 million less than parking) options, to the Skanska – Rados joint venture. The Sepulveda grade separation is also a big positive development. There is no need for parking at Westwood, with parking available nearby at Sepulveda. What’s Next for Expo – Community Outreach Edition.